KATE’S NOTES: I followed the recipe faithfully. The only thing I did different was to use roasted and salted pepitas (the seeds) as the store I went to did not carry raw ones. The flavor, at least in my opinion, was highly enhanced by the roasted seeds, which I toasted as per the recipe. You would need to cut back a little on the salt if using a salted seed. I also added lime zest to the sauce. You just can’t lose with that addition. Cut one sweet potato/yam, one red pepper and two small zucchini into 2-inch strips. Toss with olive oil, salt, pepper and place on baking sheet. Roast in 400 degree oven for 20 minutes; stir and roast until tender. Stir one cup of drained and rinsed black beans into Mexican Quinoa. 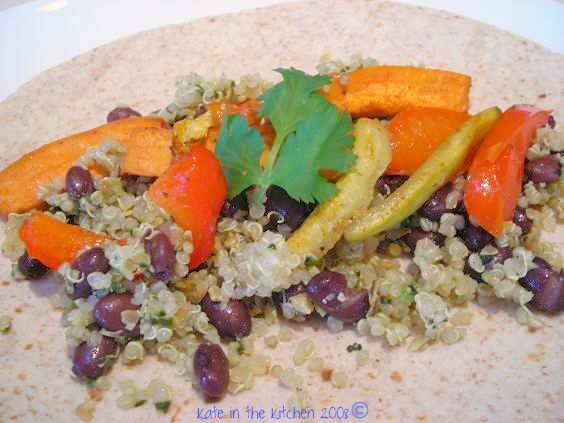 Layer quinoa/beans and vegetables on a whole wheat or multi grain wrap and fold over. Cheese is optional, enjoyment is paramount. I did the SAME THING as you when I got this book! Tabbed almost every recipe and went on my quest for various grains. I have only made a few things so far an only one I didn’t care for (the breakfast quinoa one). gotta say, kate… i’m really proud that you’ve been sticking to this eating healthier thing! quinoa is such a great grain. I recently made these quinoa cakes, but that requires a bit of frying, so not so healthy. look good, girl! Thanks for the link, Kate! I’ve never gotten into quinoa but I really should, I love every other grain! And also never tried pepitas.. I should get on that soon!! 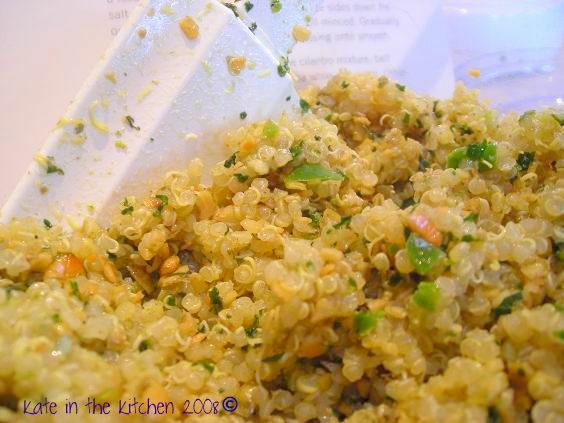 I love the the quinoa is the base for your wrap… yum! I LOVE quinoa and yet I never make it. Now I’ll all inspired and I want that cookbook. Though I’m not allowing myself any new ones until after we move!